mycloud PMS is an integrated property management system designed particularly for hotels and other hospitality institutions that offer room rentals and other related services. This cloud-based property management platform gives you a reliable and secure system with which you can use to effectively and efficiently manage all aspects of your hotel operations, including bookings and reservations, check-in, check-out, guest history, feedback management, travel agencies, and more. The software also provides POS (Point of Sale) solutions for Food and Beverages (F&B) establishments, designed to improve your workflows, enhance your service, and generate more income while bringing down your operational costs. mycloud PMS enables users to fully leverage social media to manage their business, market their services and other offerings, as well as effectively handle their brand and reputation online. mycloud PMS gives hotels and other similar establishments with a secure and reliable cloud-based hotel management system capable of handling and automating crucial processes. The system lets you take care of all your essential hotel operations such as bookings and reservations, room maintenance and management, staff scheduling and management, inventory, and more. The software also streamlines your workflows with external parties like travel agents, booking firms, agencies, etc. mycloud PMS sports a very simple and intuitive interface where you view your tasks and perform you functions in just a few clicks. You can glance to see your reservations, check-ins, and checkouts effortlessly or view your the status of each room on a daily, weekly, and monthly display. Unlike many other PMS options, mycloud PMS comes with an inbuilt credit card processor. This allows you to process on-site and online payments from your guests with ease. You don’t have to spend money purchasing external systems or additional programs to handle credit card payments. Updating and changing room rates is a breeze with mycloud PMS. You can easily define your rates based on the season or on demand. The software provides you with the option to include or exclude taxes from your rates with just a few clicks. Dealing with travel agents and booking firms is a part of the hospitality business. mycloud PMS gives you a viable solution to help you manage and keep track of all your Online Travel Agents (OTAs) as well as amend room rates with ease. What Problems Will mycloud PMS Solve? 1. Manage Hotel operations more smoothly and efficiently – mycloud PMS eliminates the manual record maintain problems in Hotel and automates the hotel operations from room booking, reservations, check-in – checkout, Billing and report maintaining providing ample time to Hotel staff to spend on guest Service. 2. Anywhere access – mycloud is a cloud-based system and it gives access to general managers or owners to stay connected with their hotel when they are away or on travel with a basic internet connection. mycloud with its IP based security makes the system more secure. 3. Receive Direct bookings from website – with a responsive and easy to integrate website booking engine now guest can book your Hotel direct from the website and booking arrives direct into PMS, eliminate the manual process of entering booking or getting duplicate bookings into PMS. If you are interested in mycloud PMS it might also be sensible to analyze other subcategories of Best Hotel Management Software gathered in our database of SaaS software reviews. Companies have different needs and requirements and no software application can be just right in such a situation. It is futile to try to find a perfect off-the-shelf software product that meets all your business wants. The wise thing to do would be to adapt the application for your specific wants, staff member skill levels, finances, and other aspects. For these reasons, do not hasten and subscribe to well-publicized trendy applications. Though these may be widely used, they may not be the best fit for your particular needs. Do your homework, look into each short-listed application in detail, read a few mycloud PMS reviews, contact the vendor for clarifications, and finally settle for the application that offers what you need. How Much Does mycloud PMS Cost? 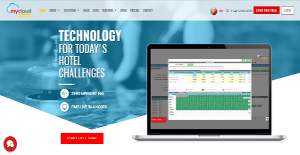 We realize that when you make a decision to buy Hotel Management Software it’s important not only to see how experts evaluate it in their reviews, but also to find out if the real people and companies that buy it are actually satisfied with the product. That’s why we’ve created our behavior-based Customer Satisfaction Algorithm™ that gathers customer reviews, comments and mycloud PMS reviews across a wide range of social media sites. The data is then presented in an easy to digest form showing how many people had positive and negative experience with mycloud PMS. With that information at hand you should be equipped to make an informed buying decision that you won’t regret. What are mycloud PMS pricing details? What integrations are available for mycloud PMS? If you need more information about mycloud PMS or you simply have a question let us know what you need and we’ll forward your request directly to the vendor.